These pizzas can get out of hand. You’ve been there. With nothing to eat, no time, or not enough will power to make someone. What do you do? Order out? Eat out? Ya we all do it. But I would like to share with you guys what my roommates and I do when we are in this position, AND we want pizza. Dominos? Oh no. We used to get Dominos when we were lazy, but it would probably cost around 20 dollars to feed 3 people. No bad. But man I just don’t feel so good eating all that Dominos. So as an alternative, I recommend those large Safeway Deli Pizzas that are refrigerated. No they aren’t frozen. And they get a shipment every other day. They usually cost on average 8 bucks for a whole large pizza. It feeds 3 hungry guys, at 8/3 dollars each. The dough is good. So what I do is I dress it up, Sandra Lee style. Half store bought, half fresh. This works very well when you have bits of things already in your fridge, like some left over mushrooms, onions, anything! So you can make any kind of monster deluxe pizza you want. I just have 2 tips for you. Firstly, know how the things you put on the pizza cook. Mushrooms have a lot of water content so you may want to precook them on the stovetop with some olive oil to cook them down. Same thing for any frozen products. Of course, any raw meats should be cooked first. Got some left over chicken? Chop it up and throw it in. Have a bunch of unused herbs? Chop them up and throw it in. Secondly, I like pizza that is flaky but still has some body. To get this texture, I brush (more like rub) olive oil on the crust, and drizzle the pizza with olive oil after I finished topping it. I also usually sprinkle the crust with either fresh garlic, or garlic powder. 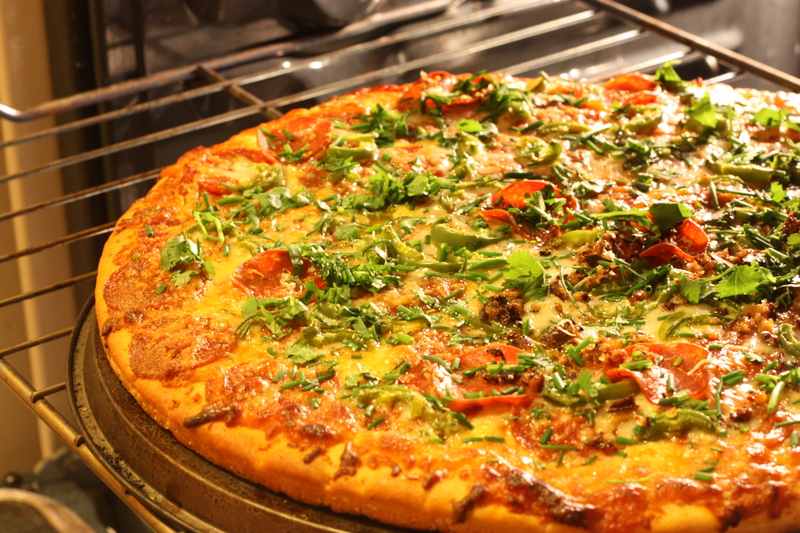 Here are just a few pizza’s I make: First from the featured pictures, I have a chive, cilantro, extra pepperoni and herring pizza. 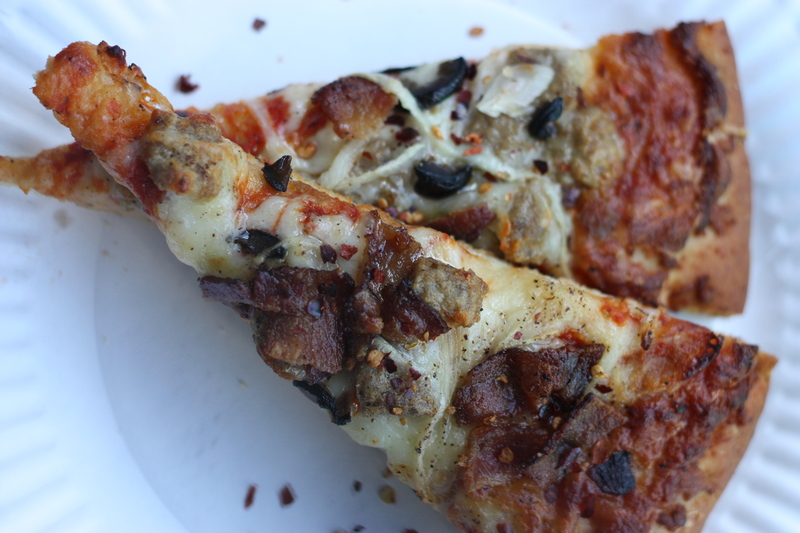 Also, a bacon, sausage, onion, New York White Cheddar pizza. Other favorite pizzas include a Santa Fe one with honey chipotle chicken with bell peppers, onion, and lime; another one is a Mediterranean pizza with olive, artichoke, spinach, and feta cheese. In the time it takes you to order and receive delivery, you can have one of these. For way less. This entry was posted on March 5, 2012 by rrfoods in Dinner, Lunch, Quick Nom and tagged pizza, quick nom, safeway.